Looking for a vacation that packs a big punch? 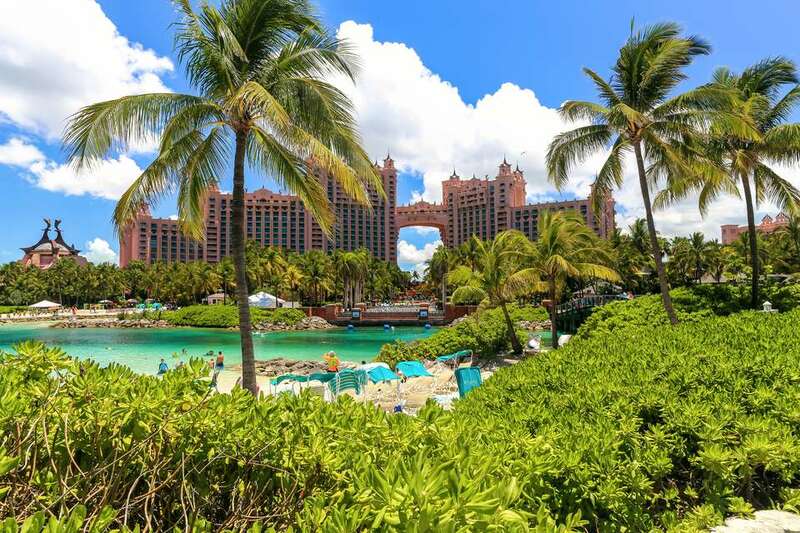 Since bursting on the scene two decades ago, the Atlantis Resort on Paradise Island in the Bahamas has become a legendary destination that's at the top of many family vacation wish lists. With its massive scale and larger-than-life features, the mega-resort and water park deliver a Vegas-like energy and array of knock-your-socks-off experiences — and it's even better when you snag a deal. Explore these 10 amazing adventures for families. Families staying at Atlantis can enjoy complimentary access to the resort's jaw-dropping 141-acre Aquaventure waterscape featuring incredible Atlantean-themed towers, thrilling high-speed water slides, a mile-long river ride with rolling rapids and wave surges, 20 swimming areas, a spectacular kids water-play fort, and 11 unique swimming pools. Love adrenaline-fueled water slides? The most daring of them all is the Leap of Faith, which delivers a 60-foot almost-vertical drop from the top of the world-famous and iconic Mayan Temple. The body slide propels riders at a tremendous speed through a clear acrylic tunnel submerged in a shark-filled lagoon. Families can take a snorkel adventure together through the Ruins Lagoon alongside sharks, spotted rays, and tropical fish. With over 20,000 deep-reef and pelagic fish, the resort's 2.7-million-gallon marine exhibit is the largest marine habitat in the world. Minimum age is 8. Love lazy rivers? For younger kids, try the Lazy River Ride for a tranquil, relaxing float on the quarter-mile lazy river. Feeling adventurous? Plunge into The Current, where you'll be propelled quickly along a mile-long river in inner tubes via water escalators, rolling waves, and extreme rapids powered by master blaster technology. Families can indulge in multiple encounters with flippered creatures at the on-property Dolphin Cay, from shallow water interactions and deep water swims to trainer-for-a-day programs. Minimum age is 6. Reflecting the tunnels of the lost continent of Atlantis, The Dig is a series of aquariums that includes over 100 venomous Indo-Pacific Ocean Lionfish, 500 piranhas, iridescent jellyfish, and ​six-foot-long Morey Eels. There is also a predator lagoon and an interactive touch tank filled with conch, starfish, sea urchins, sea cucumbers, crabs, and horseshoe crabs. No minimum age. Not certified for scuba diving? No problem. Take your family on a snuba adventure to explore the undersea marine life at Atlantis. This activity blends the simplicity of snorkeling with the wonders of breathing underwater. Minimum age is 8. Paradise Island’s Climber's Rush is a state-of-the-art rock climbing facility featuring 12 climbing surfaces. Your family can do a one-time vertical climb or sign up for a group clinic with a focus on teamwork and communication. Minimum age is 6. Kids ages 3 to 6 can attend the SeaSquirts program for a one-hour interactive marine program with 20 minutes of marine activities and 30 to 40 minutes of supervised feeding time at the fish nursery. Every kid gets a keepsake SeaSquirts swim shirt. Kids ages 3 to 12 can take part in Atlantis Kids Adventures, choosing to get downtime in the play zone or take part in an activity (cooking lessons, electronic art, theater, and more) within themed spaces designed specifically for them. Teens can head to the 14,000-square-foot CRUSH Teen Club, which boasts an internet lounge, gaming room, and a live DJ.